Charles Ryrie (1925-2016) was long-time professor of Systematic Theology at Dallas Theological Seminary and Dean of Doctoral Studies. He was an ardent dispensationalist, pretribulationalist, and premillennialist. His book, Dispensationalism Today (now reprinted as Dispensationalism, of which I treasure an autographed copy from him in person) has been a standard text book for conservative schools for decades. I have always used and enjoyed his Basic Theology as a reference for systematic studies. In seeking a text for a Bible study in doctrine, I read (or reread) this 1972 paperback and saw that it would be a great study guide for students and leaders in the church. It is a condensed (184 pages) version of his longer theology. Ryrie has nine sections (combining anthropology and hamartiology which are usually taught as separate sections) and I divided these up into four or five lessons each. I have those sections with the page numbers if anyone is interested. 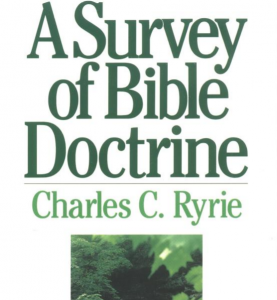 Ryrie’s doctrine would fit the great majority of Baptist churches, especially if they are traditional dispensationalists and pretrib and premill. Because Ryrie was not a Baptist formally, he leaves some ambiguity on baptism and church polity. For example, on page 142 he writes, “Actually it does not specify the mode of baptism or the particular kind of officers.” But on page 152 he writes, “One seems driven to the conclusion that immersion is the biblical mode,” and on page 147 in describing the congregational form of church government (as opposed to hierarchial, federal, and national forms) he gives four arguments in favor of it and includes arguments for the singular pastor, or elder. In addition, it is commonly known that Ryrie was opposed to modern expressions of Lordship Salvation and in this treatise he answers that position with four pages (134-138) of argumentation. These are similar to what he writes in Balancing the Christian Life. If you like Ryrie on other things, you’ll like this book as well.